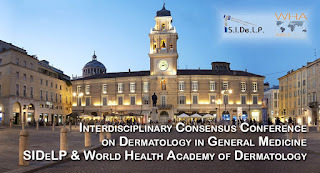 Ab2014, Abstract, ADMG-ADI-2014, Congresso Nazionale ADI, Congresso Nazionale ADMG, Gisondi P.
Clinica Dermatologica, Università di Verona. The treatment of psoriasis requires long-lasting intervention. Conventional treatments for psoriasis comprise topical, phototherapeutic, and systemic modalities, such as methotrexate or cyclosporine. Biological therapies are advocated by treatment guidelines for the use in moderate-to-severe psoriasis, when conventional treatments have failed, are contraindicated or are associated with severe adverse events. Etanercept is an anti-TNF recombinant fusion protein that has emerged as a standard biologic treatment option for moderate-to-severe psoriasis. The presentation will summarize data from pivotal and post-marketing randomized controlled etanercept trials to treat moderate-to-severe psoriasis for 24 weeks and longer. During the first 12 weeks, etanercept can be administered in different dosing regimens, i.e. 50 mg twice weekly and 50 mg once weekly. Although both regimens are effective, it has been shown that the 50 mg twice weekly dosage leads to higher response rates at week 24. In addition, after 24 weeks' treatment etanercept provides the unique possibility of continuous or intermittent long-term treatment programmes. The medium- to long-term efficacy of etanercept was consistent, regardless of whether etanercept therapy was interrupted or continuous. Taking the chronic nature of psoriasis into account, this flexibility in dosing regimen bestows a key advantage in facilitating individualisation of long-term treatment according to patient needs.